... Or at least mostly so. Whatever modifications I make from here on out, will probably be relatively minor. It took roughly 4 months to acquire and build. The motherboard is still ROM 03 with the prototype ROMs that contain a QuickDraw II bug that is unlikely to bother me. 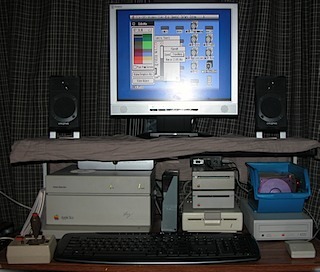 The CDROM drive is an AppleCD 300e, now containing the Golden Orchard CDROM, which is a seemingly-infinite collection of applications, games, information, and even .MODs. There may be some more minor changes (replace 800K disks with Superdrives, swap some cards around for better circulation, etc), but for the most part, this is it. And I got Toolbox Reference 3 and GS/OS Reference in the mail, so I've got to do some more reading and step into the world of resources. I suspect my game could benefit greatly from a good knowledge of resources. I'm sure I'll dive into it and post something here about the results. Till then.